It is easy to see the role of pattern in art. But pattern plays a central but under-appreciated role in fields as diverse as mathematics, physics, philosophy, mythology and religion. Many define Mathematics as “the science of patterns” (for example Steen, 1988, and the NCTM Principles and Standards). The title of Devlin’s book is “Mathematics: The Science of Patterns.” Resnik’s book is entitled “Mathematics as a Science of Patterns.” Mathematics guru Ian Stewart often points out that “Mathematics is about patterns” (for example, 2012, page 109). A pattern is a discernible regularity or order, some object regularly repeating, typically over time or space. 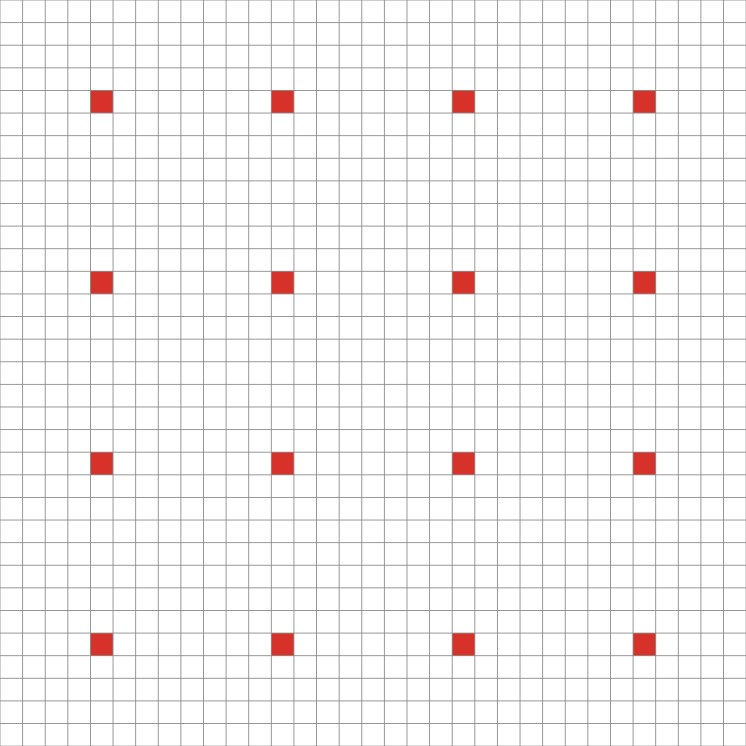 When defining pattern, many emphasize that the regularity is based on a rule. Patterns that seem complex, like fractals, very often have underlying simple rules. 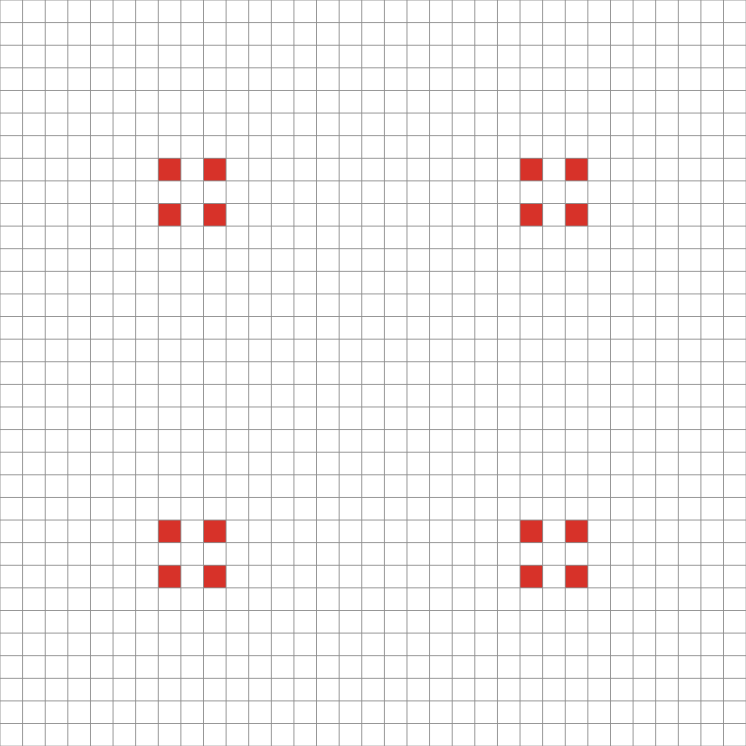 Other patterns are simple by any standard. For example, starting at zero and repeatedly applying the rule: “Add 1” generates the sequence 0 1 2 3 4 5 6 7 8 … So something as simple as counting is a one-dimensional additive pattern we learn by kindergarten. Likewise, starting at zero and repeatedly applying the rule, “Add 2,” results in the sequence: 0 2 4 6 8 and so on. Notice that multiplication is implied in the rule “Add 2.” Starting at zero and using the rule, “Add 4,” we get a sequence where each number is twice the amount of the corresponding numbers generated by the rule “Add 2.” The second rule adds twice as much as does the first rule. We can input each term of a list, one by one, into the x part of the equation y = 2x and then generate a series of values for y, a second list. The equation shows a pattern as an algebraic relationship, which can handle not just whole numbers but any number in between whole numbers. But it is helpful to see the simple underlying rules that generate simple additive patterns, number sequences, that we learn in kindergarten. A checkerboard is a very simple two-dimensional pattern based on a simple rule that determines the regularity or order. 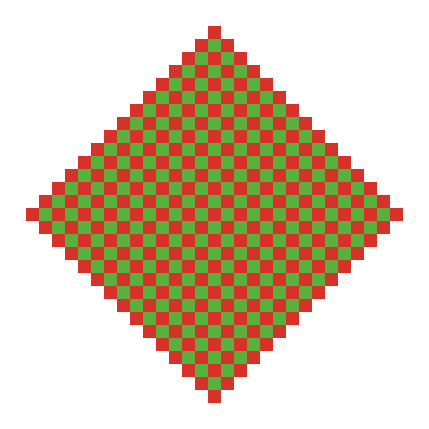 Rules like every other space is a different color directly determine the checkerboard pattern. 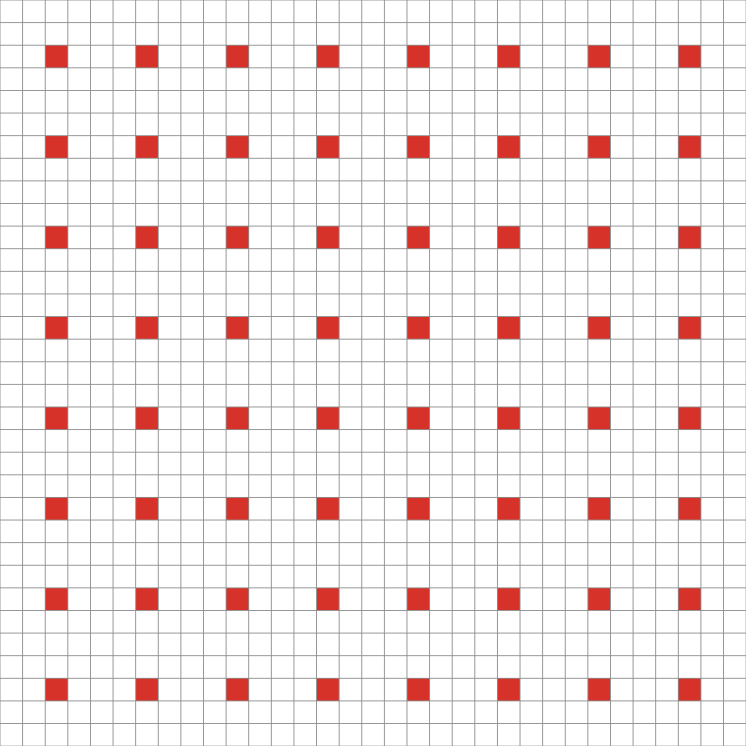 The rules can predict exactly what any size checkerboard would look like. Likewise with any exactly repeating sequence of numbers or shapes, pattern leads to prediction. 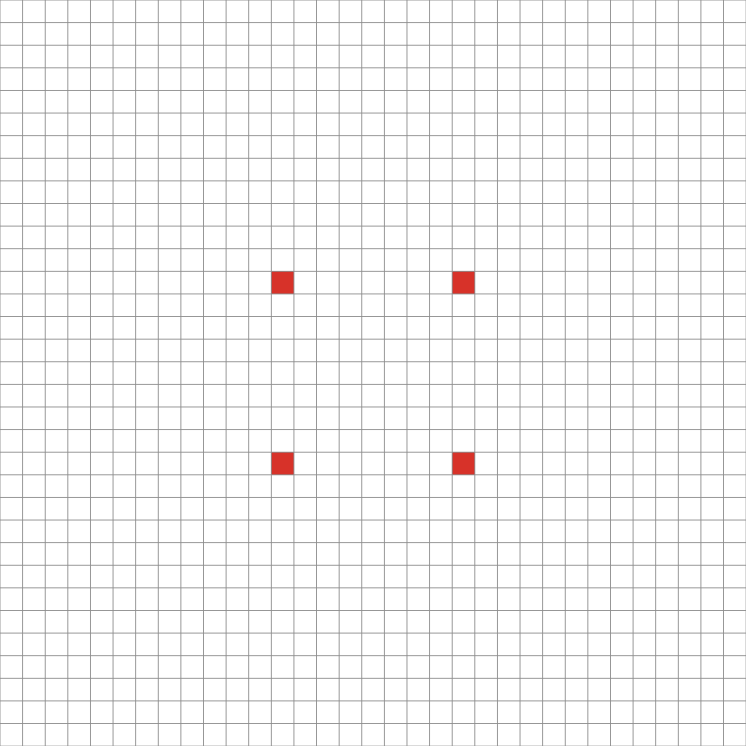 Below we use the rule, each square gives rise to four neighbors of the opposite color. We start with a single red square. Surround the four sides of that red square with green squares. Then surround the four sides of each of those green squares with red squares. 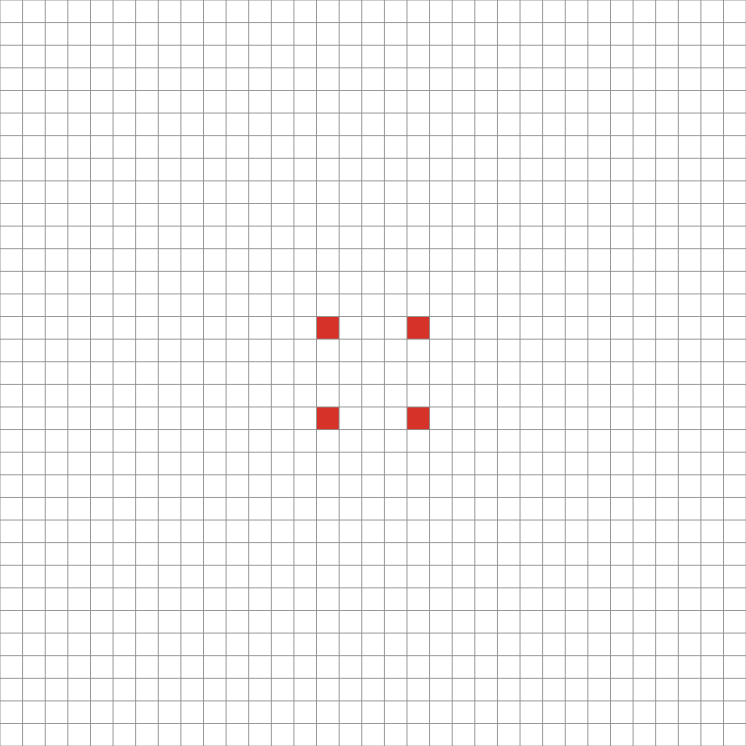 (it makes no difference if a square already has a neighbor). The fourth picture shows the result after repeating this rule 14 times. Such patterns are exactly predictable by the rules. 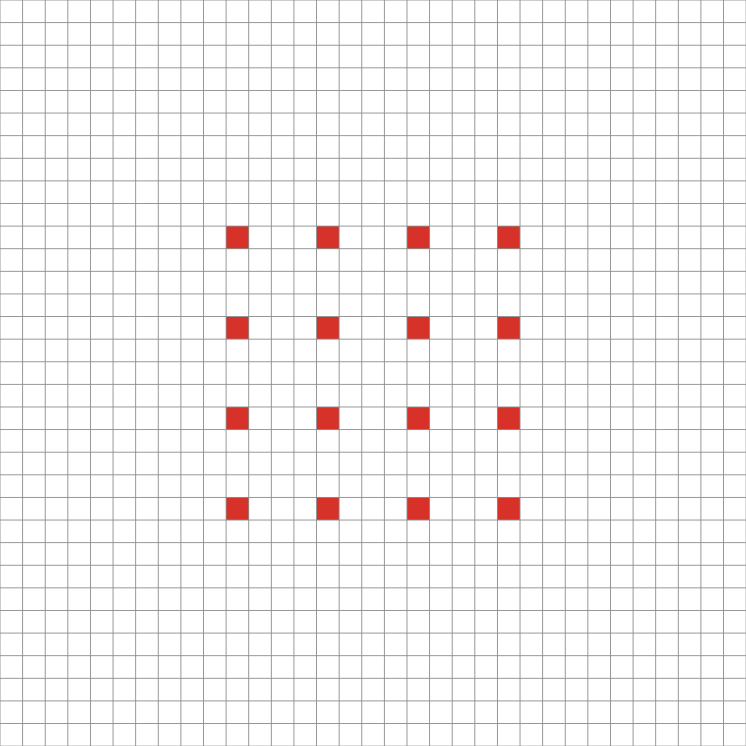 Below we start with a single square, but the following rule: Each square gives rise to eight neighbors (includes diagonals). 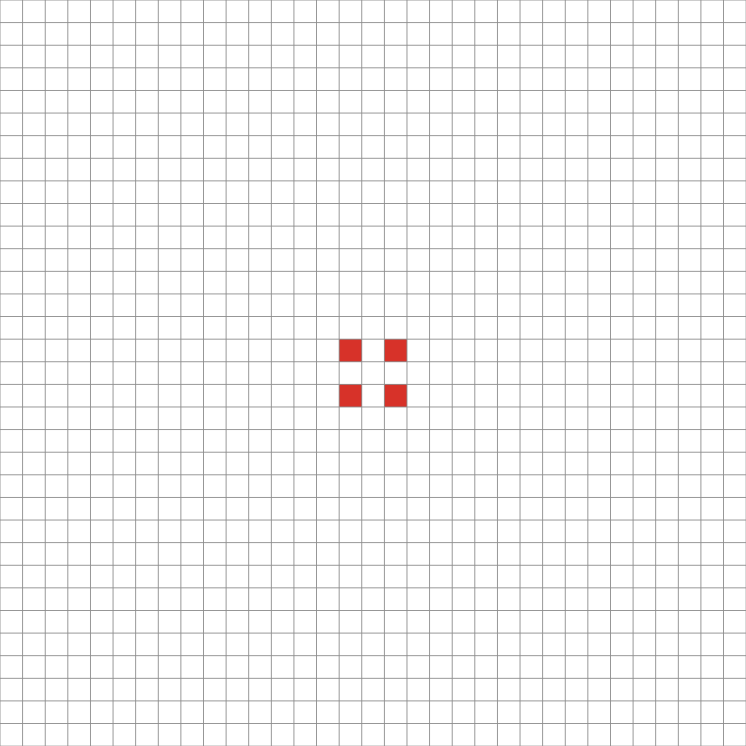 Then any square that is not next to four white neighbors will die. 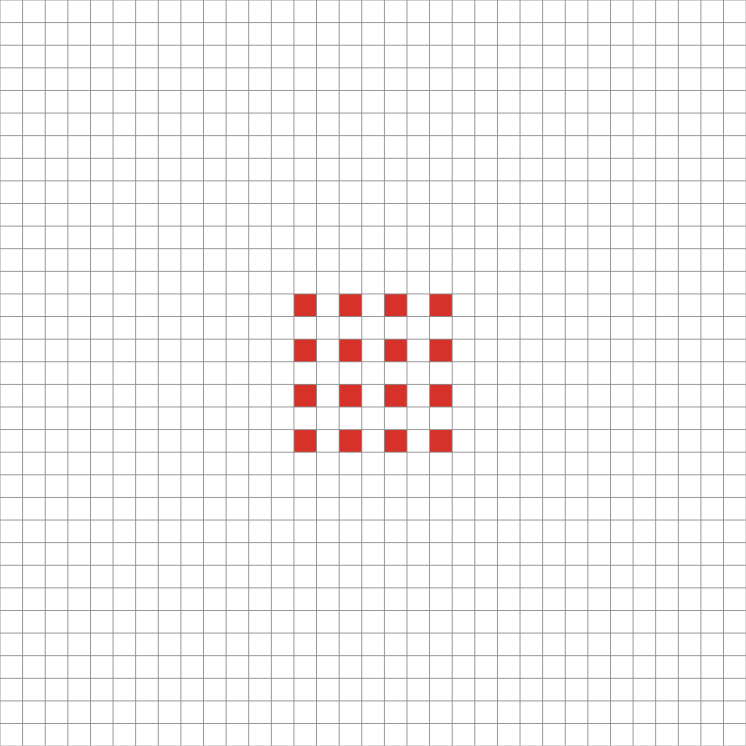 Then again each square gives birth to eight neighbors, then any square that doesn’t have at least four white neighbors dies away. Repeat this and you see the below patterns. 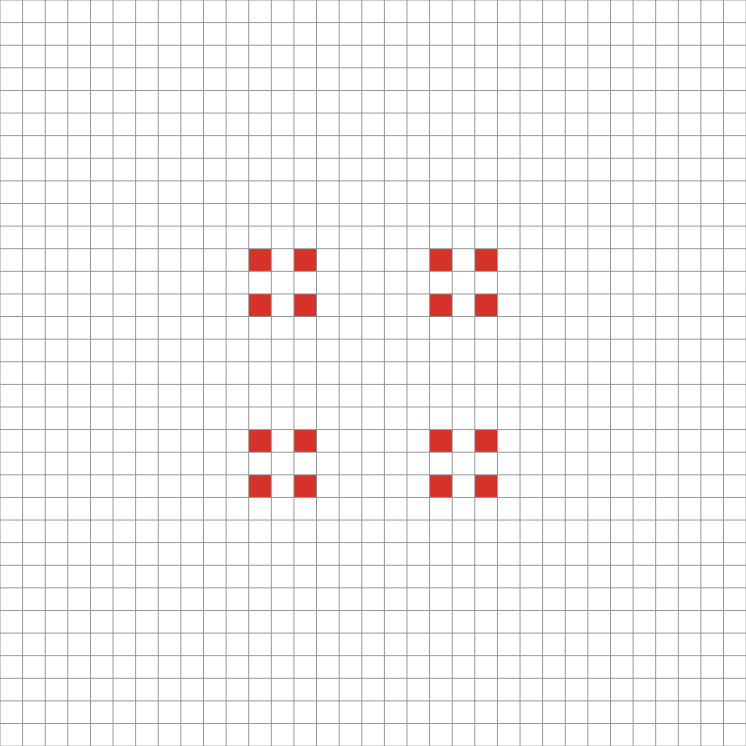 After repeating these two steps 12 times, we end up with the below pattern of 16 spread out squares. After two more iterations of these two rules, we have 64 squares, evenly spaced. Yet simple rules also give rise to more complex patterns, even chaotic patterns. Patterns of great complexity and beauty emerge from simple rules. We explore emerging patterns with our models and games. Hardy, G. H. A Mathematician’s Apology. Cambridge: Cambridge University Press, 1992. National Council of Teachers of Mathematics (NCTM). Principles and Standards for School Mathematics. Reston, VA.: NCTM, 2000. Resnik, Michael D. Mathematics as a Science of Patterns. Oxford: Clarendon Press, 1999. Steen, Lynn Arthur. “The Science of Patterns.” Science 240 (April 1988): 611-616. Stewart, Ian. In Pursuit of the Unknown: 17 Equations that Changed the World. New York: Basic Books. 2012.